A tennis swing is not one continuous swing. It is a two part swing. The first part of the swing is called the unit turn. 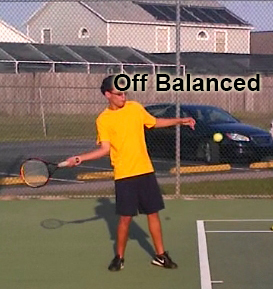 The unit turn involves turning the body and racquet together in unison, getting both into a good swinging position. Moving the body and racquet in unison is one of the most important elements of any effective swing. If done incorrectly, the unit turn is the first place during the swing that the body can get out of sync with the racquet. A mistake during this phase of the swing can make it virtually impossible to recover and hit a good shot. The unit turn is not called a back swing as that makes it seem like the racquet should be swung back, which it should not. Although, I can understand why some would call it a back swing because a proper unit turn does get the racquet back where it needs to go, it is just not done by swinging the racquet. Swinging the racquet back would involve mostly moving the arm and not turning the body enough. Isolating the swing with just the arm would make the body go out of sync with the racquet and arm as they would be moving at a different rate then the rest of the body. This would lead to a less powerful and less consistent swing. It would also mean that the arms muscles would end up being the main power source for the swing which would greatly diminish the power of the swing as the arms are much weaker then the muscles in the bodies core region or in its legs. The rotating or coiling of the hips and shoulders helps to build up energy which is used later in the swing to add power to the stroke. This is why its best to use the whole body to swing, not just the arm. It is called a unit turn because the body and racquet turn as one. To get the racquet back we turn the whole body. 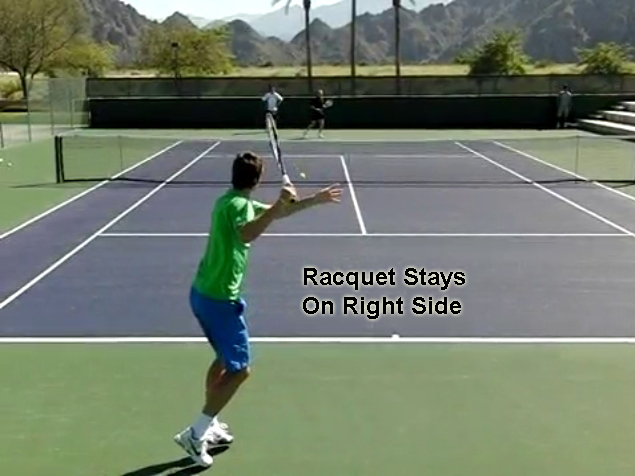 The racquet does not even need to be moved, the turning of the shoulders and hips will turn the racquet. 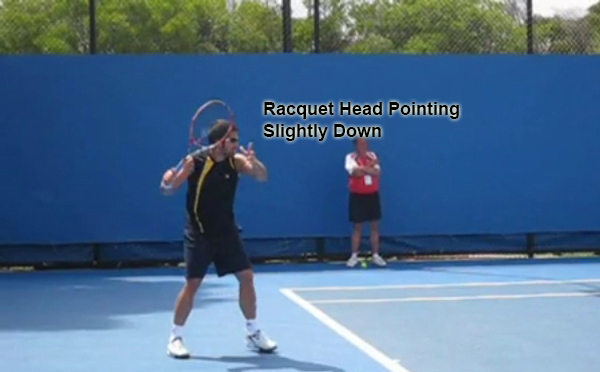 Hover over the below image to see that the racquet is still centered. A proper unit turn will allow for, potentially, a more consistent, powerful and accurate shot by keeping the body and racquet in a good position. It helps the body to maintain good balance and helps in getting to the ball much quicker by putting the body and racquet into a good running position. It also can facilitate the correct swing pattern by keeping the racquet on the right side of your body which will help keep a vertical swing. This is effectively what is happening when a unit turn is done. This is also not an effective way to run fast. 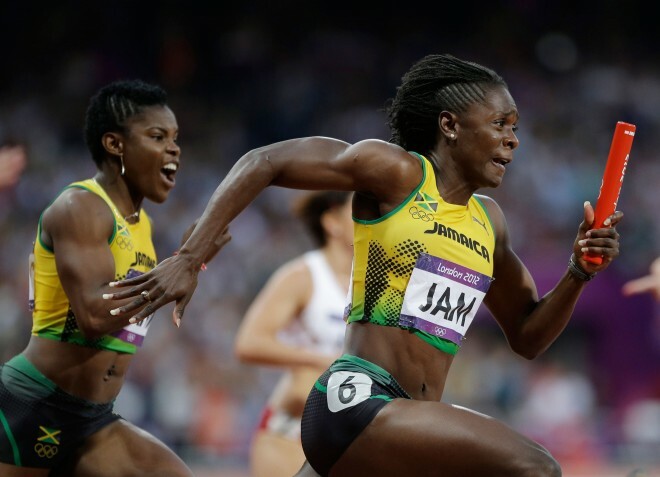 For a relay race, runners will run with the baton off to the side and parallel to the way they ae running, not perpendiculoar to the way they are running. The racquet cannot be taken back too early. As soon as it is known where the ball is being hit a unit turn should be done. The effect is it allows a player to get to the ball quicker giving them more time to make little adjustments to the swing. These little adjustments allow for the ball to be hit cleaner and more likely be a successful shot. The later one gets to the ball, the less time there is to make these little adjustments and the more likely the shot will be missed. To start the unit turn, turn the shoulders and hips in unison while not moving any other elements of the body, including the racquet. The racquet should still be in the middle of the body, just like in the ready position. In the below images you can see that Novak Djokovic’s racquet is still in relatively the same centered position at the start of the unit turn as it was in the ready position. The shoulders and hips are moving in unison with each other, That is what is causing the racquet to move. Any excessive movement of the racquet at this stage will most likely bring the body out of sync with the racquet and arm and will result in, potentially, a loss of consistency and power. Most recreational players will swing their racquet either up or down, which will make them use extra muscles and give the racquet too much momentum. Too much momentum will make it difficult to control the racquet and keep it from moving fluidly with the body as the body will need to stop the racquets momentum from going one way to get it going another way. Unfortunately once the body gets out of sync with the racquet its virtually impossible to get it back in sync. Using extra muscles will also make the body tenser and less fluid which will lead to a loss of power. When the unit turn is completed your racquet should be in the exact same position, relative to your body, as it was in the ready position. The top hand should stay on the racquet as the unit turn is starting. By leaving the top hand on the racquet both shoulders will coil. The coiling of both shoulders (especially the front shoulder) adds a large power source as the body unwinds during the swing. 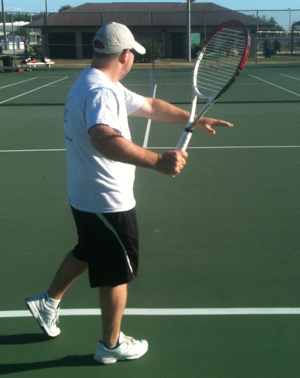 The top hand on the racquet also helps to stabilize the racquet by keeping the racquet head from moving. The top hand can be taken off the racquet once the body has rotated about 60-90 degrees. 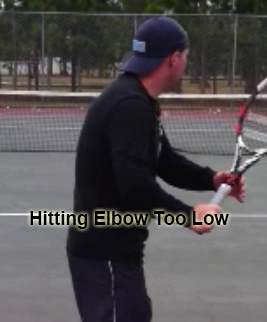 If the top hand is left on for too long it can potentially make the hitting elbow come down and end up being too low. This can lead to wrist layback and to potentially allow the racquet to get out of sync with the rest of the body causing a loss of power and consistency. 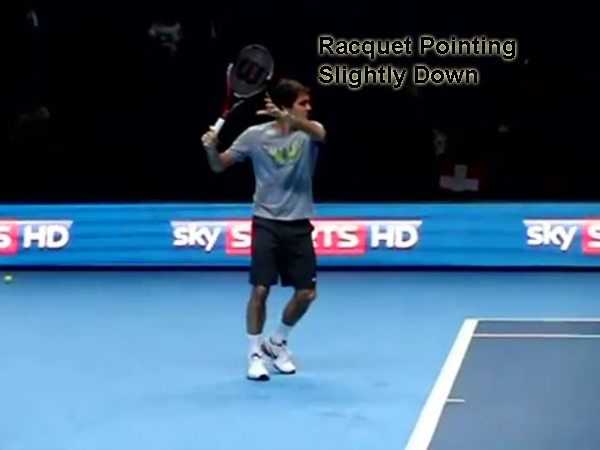 Once taken off the top hand should be moved off to the same side the racquet is on. 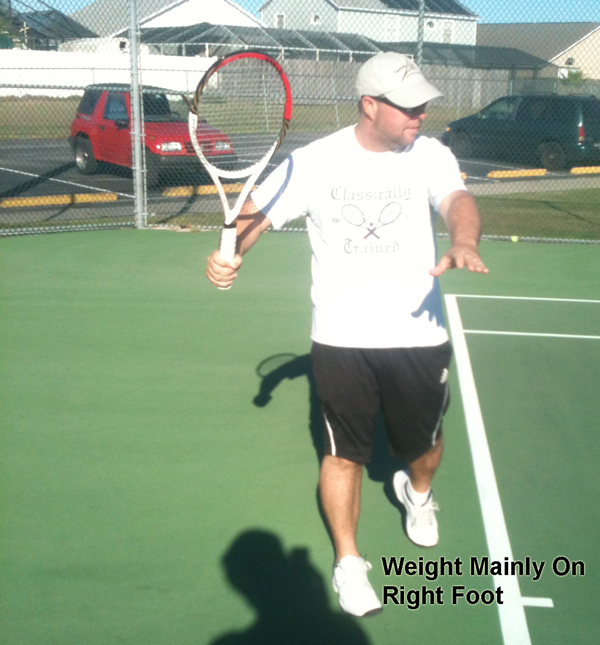 By moving the top hand to the same side the racquet is on the body gains more stability and balance. The front arm should be relatively straight and at relatively the same height as the hitting arm. A low front shoulder will also make it hard to rotate fully through the shot and make hitting the ball to the left more difficult. 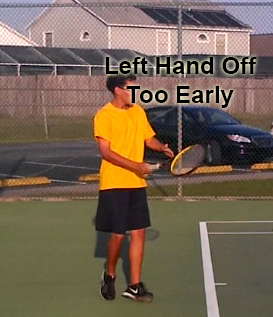 Many recreational players take their top hand off the racquet too early. If the front arm ends up too much in front of the body by taking it off early the shoulders will not be coiling enough and power will be lost later in the swing. The swing is also much more likely to be horizontal instead of vertically as the left arm will tend to lead the way instead of the right arm and racquet. This will make the hitting zone smaller due to swing being more horizontal. Plus, the body can easily lose balance if the non hitting arm is too much in front of the body. The left arm should not be anywhere else as it means that either the shoulders did not rotate far enough or the left arm has been moved forward since turning. The left arm helps maintain balance throughout the swing and while in the unit turn plus is essential for elongating the hitting zone by keeping the swing vertical. 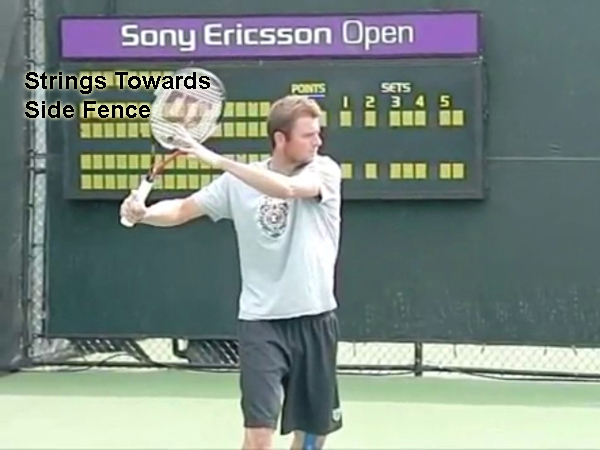 After taking the left hand off the racquet, the body and racquet should continue turning until the belly button is pointing to the side fence. and still on the right side of the body. The hitting elbow should be up and off the body like it was in the ready position. As long as the elbow is not moved during the unit turn. It will be up at the end of the unit turn. This is why the elbows should be up during the ready position. 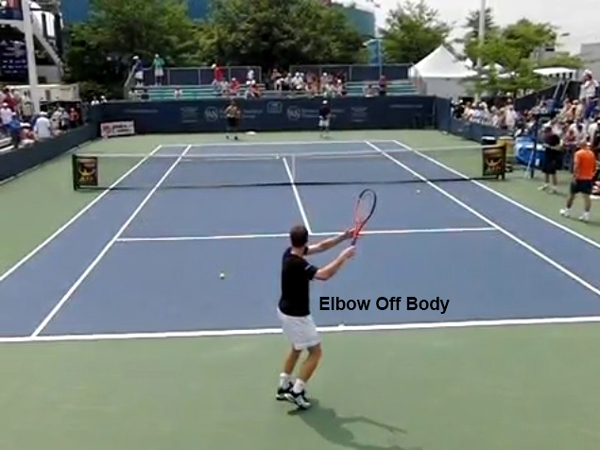 Keeping the elbow up will help the racquet stay on the right side of the body when the forehand swing is started. It is virtually impossible to bring the racquet behind the back if the elbow is up. Keeping the racquet on the right side of the body will also help the swing stay vertical and elongate the hitting zone.The elbow up will also keep you from laying your wrist back by leaving the wrist behind the racquet. 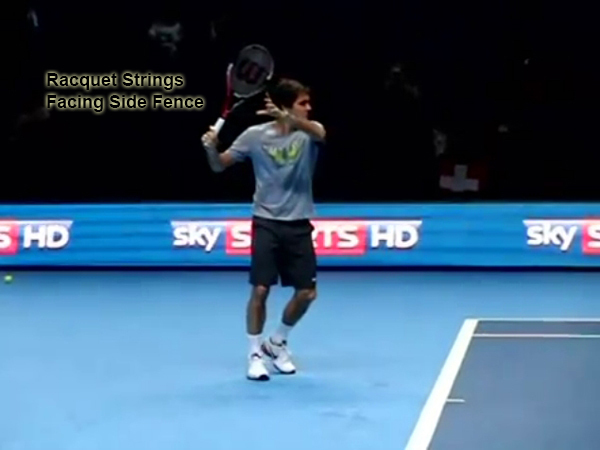 Laying the wrist back usually takes the racquet out of sync with the rest of the body as discussed above. Too low of an elbow makes it easy to elongate the back swing. An elongated backswing is actually detrimental to a good forehand as it takes much longer to get the swing started and to the ball contact point. An elongated backswing also can potentially lead to a horizontally swing. The legs should have a slight bend, but for the most part are straight. The body and racquet must stay in unison with each other. Since the racquet is high, the legs stay high. The bodies weight should have naturally shifted from equal on both feet to being mainly on the right foot. This will allow for the weight to shift forward during the swing and make it easier to step into the shot giving a more powerful shot. The toes should rotate towards the side fence as well. This helps to maintain body balance. If in a position where no running is needed to hit a forehand, the feet shouldn’t be moved from where they were in the ready position. Hover over the below image of Novak Djokovic to see this. This gives the option to either hit the ball from an open stance or to hit from a neutral stance. If the left foot is moved too early into a neutral stance the weight may start shifting forward before the proper time which can limit power for the swing. If running is required before hitting the ball a similar setup is best with the left foot on the left side of the body. This makes it so the weight can still transfer at the proper time. Hover over the below image of John Isner to see this. There are not many things that I teach beginners differently than a more advanced player, but this is one element. For beginners you want the unit turn to continue until the trailing edge of your racquet is pointing towards the back fence. This really helps to limit the amount of wrist and racquet movement that you can do by decreasing the size of the swing. 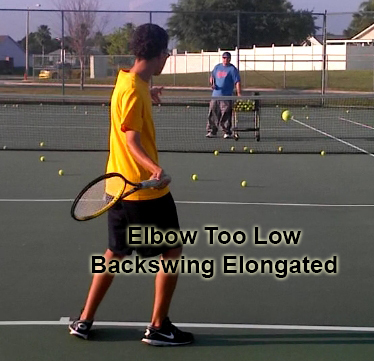 It also helps to make sure that the elbow is up during the beginning part of the forehand swing. Beginners want to get into this position as quickly as possible by turning the whole body without swinging the racquet. Once here pause for however long it takes until the racquet drop should begin. The racquet cannot get back into this position too early! More advanced players can start the forehand swing once they release their left hand off the racquet in more of a wheel type swing. This is what most pro’s and advanced players will do. They, just like beginners, will get into this position as quickly as possible. The pros will still end up in the same unit turn position as a beginner, but by that time they are already well into the forehand swing. Because the pros end up in the same position I could use the above pictures to illustrate my points. The pro’s stop their unit turn as the top hand comes off the racquet because it will help to generate more power. Beginner’s shouldn’t do this because they often times will start swinging the racquet really fast once they take the hand off and this will make the forehand very inconsistent. The pro’s will start their forehand very slow and not speed up the racquet until well after the racquet has started to drop. 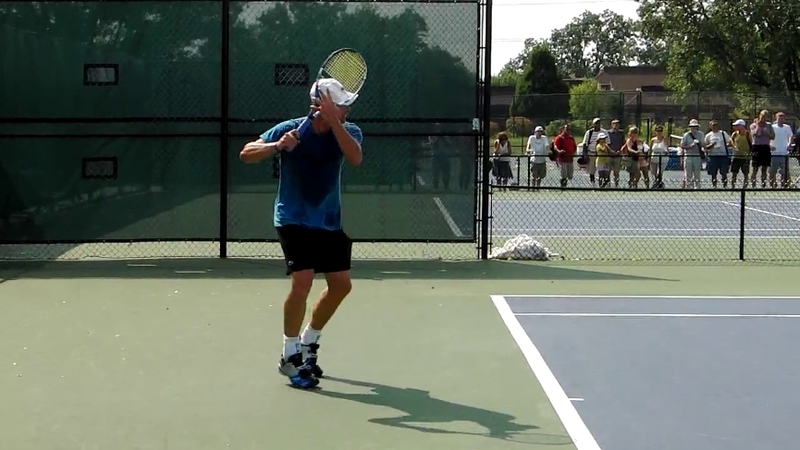 A unit turn is a necessary part of any good forehand swing whether you are a beginner or professional. The emphasis on a good unit turn should be the same regardless of the players ability. But, the higher level the player, the better the unit turn tends to be.